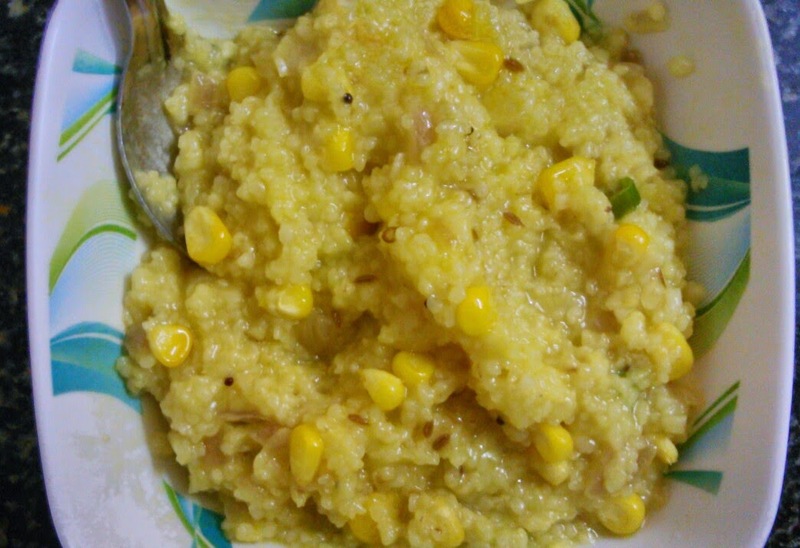 I am back with another upma recipe. Am a big big fan of upmas be it Rava upma or Vermicelli upma or Dalia upma. Dalia is said to be healthy option for breakfast and can be prepared as a sweet delicacy or a spicy one(I don't like sweet dalia though). So going back to the recipe, this is easy and quick. 1) Pressure cooker dalia using water upto 4 - 5 whistles. Cook as we cook rice in pressure cooker. Let it cool down. For 1 cup of dalia around 2 cups of water is needed. You can always cook the extra water while preparing the dish. 2) Take a pan or kadhai and heat oil in it. Add mustard seeds and then cumin seeds. Add chopped onion and fry till it's faint brown. 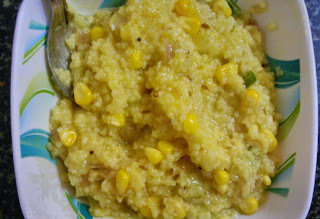 Add sweet corn and stir fry till the corn is tender. 3) Add turmeric powder and dalia and mix well. Add salt according to taste and let it cook on low flame for 5-7 minutes. 4) After it is cooked well, turn off the flame and garnish with lime juice and coriander and serve. NB - If extra water is there after cooking the dalia that can be cooked when the dish is prepared. Do you have a favourite breakfast dish. Share with me in comments section below.